Because tween and teen girls have emerged in the marketplace as key contenders in the gaming space, LeapFrog has given its Leapster handheld product a face-lift. To complement the new look, the Leapster system now has software titles targeting the girl gamer including Junie B. Jones and Disney Princesses. The company offers a large educational software suite for handhelds. The Leapster system is actually four systems in one (interactive video player, handheld gaming system, creativity platform and digitized book reader). With the new Leapster cartridges, users can solve a mystery with The Incredibles; become a spelling whiz with Spider-Man; keep a journal with Junie B. Jones; or swim along with Dory and Marlin as they set out to rescue Nemo. 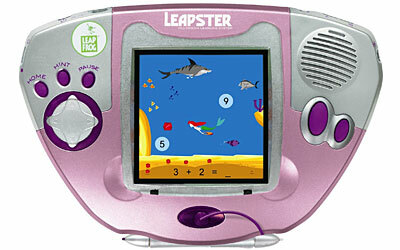 The Leapster Multimedia Learning System platform is available for eighty dollars, with the software cartridges costing between twenty and twenty-five bucks.